1 of 3 Heat oven to 400 degrees . Peel and halve onions; cut into 1/4-inch-thick slices. Heat 1 tablespoon of the oil in a large saute pan over medium heat. Add onions and 1/4 teaspoon of the salt. Cook 8 to 10 minutes or until softened. Add garlic and cook 1 minute. Stir in beans, 1/2 teaspoon of the herbes de Provence and 1/8 teaspoon of the pepper. Pour mixture into bottom of a 9 x 13 oven-safe casserole. 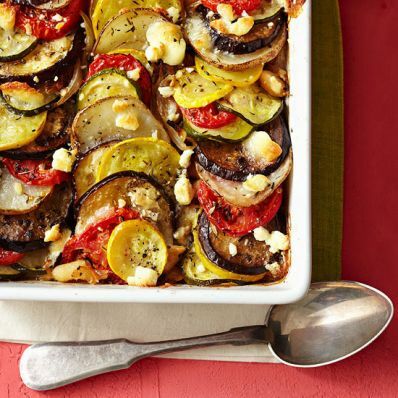 2 of 3 Meanwhile, cut eggplant, squash, potatoes and tomatoes into 1/4-inch thick slices. (To speed things up, use a food processor fitted with a slicing blade or a mandoline.) Toss vegetables with remaining 2 tablespoons olive oil, 1/2 teaspoon salt, 2 teaspoons herbes de Provence and 1/8 teaspoon pepper. Arrange vegetables on top of onion-bean mixture in 1 layer; pack tightly. 3 of 3 Cover dish with aluminum foil and bake at 400 degrees for 45 minutes. Remove foil and crumble goat cheese on top. Bake 15 more minutes. Cool slightly and slice into 4 servings. Per Serving: 12 g fiber, 701 mg sodium, 6 g sat. fat, 13 mg chol., 15 g pro., 378 kcal cal., 17 g Fat, total, 45 g carb.